Douglas Noël Adams was an English writer, dramatist, and musician. 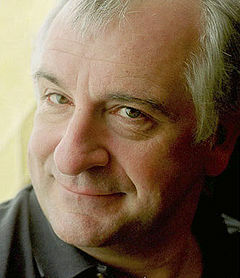 He is best known as the author of The Hitchhiker's Guide to the Galaxy, which started life in 1978 as a BBC radio comedy before developing into a "trilogy" of five books that sold over 15 million copies in his lifetime, a television series, several stage plays, comics, a computer game, and in 2005 a feature film. Adams's contribution to UK radio is commemorated in The Radio Academy's Hall of Fame. He also wrote Dirk Gently's Holistic Detective Agency (1987) and The Long Dark Tea-Time of the Soul (1988), and co-wrote The Meaning of Liff (1983), Last Chance to See (1990), and three stories for the television series Doctor Who. A posthumous collection of his work, including an unfinished novel, was published as The Salmon of Doubt in 2002. Known to some of his fans as "Bop Ad" for his illegible signature, Adams became known as an advocate for animals and the environment, and a lover of fast cars, cameras, and the Apple Mac. He was a staunch atheist, famously imagining a sentient puddle who wakes up one morning and thinks, "This is an interesting world I find myself in–an interesting hole I find myself in–fits me rather neatly, doesn't it? In fact it fits me staggeringly well, must have been made to have me in it!" The biologist Richard Dawkins dedicated his book, The God Delusion, to Adams, writing on his death that, "Science has lost a friend, literature has lost a luminary, the mountain gorilla and the black rhino have lost a gallant defender."